Ukraine's Viktor Yanukovych and Russia’s Dmitry Medvedev had a meeting in Kiev yesterday, May 17th. The official ceremony was marred with a confusing incident that occurred to the Ukrainian leader. The two presidents took part in the ceremony to lay wreaths to the Eternal Flame on the Tomb of the Unknown Soldier in Kiev’s Park of Glory. 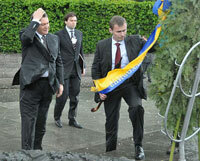 Afterwards, Medvedev and Yanukovych did the same near the monument to the victims of mass famine in 1932-1933. The ceremony was held under extremely unfavorable weather conditions: there was a very strong wind and it was pouring rain. Journalists of the Ukrainian Pravda newspaper witnessed the moment, when Mr. Yanukovych arranged the ribbons on a large wreath, stepped back and bowed his head. A gust of wind picked up the wreath and threw it onto Yanukovych’s head at the moment when he was looking down. Security guards rushed to help the president put the wreath back to its place. The press service of the Ukrainian president asked the media not to post any videos or footage of the incident. The video of the incident shows that Medvedev’s security guards were also alarmed with what happened to the Ukrainian president. They ran up to Medvedev and held the wreath with their hands to prevent it from falling. “It is our seventh meeting. It’s a good number, and should become the starting point for you after which you will be visiting Kiev regularly,” Yanukovych told Medvedev when their meeting continued. The Russian leader said that he was missing Kiev a lot. “It’s been a while since I visited Kiev last. As for the weather – it’s good to wipe the slate clean. I hope that the rain will wash away all the negative things and leaves us a blank page to develop our friendly relations,” the Russian president said. The turnover between Russia and Ukraine has increased 1.5 times during the four months of the current year. It is expected to reach the level of $35 billion by the end of 2010, Ukrainian officials said. Medvedev and Yanukovysh signed a package of documents as a result of their meeting in Kiev. They made a joint statement pertaining to the issues of the European security. The statement says that Moscow and Kiev support the withdrawal of visa barriers and the establishment of the visa-free space on the European continent. Russia and Ukraine also stand for the expansion of the mutually beneficial cooperation between Russia’s Black Sea Fleet and Ukraine’s Navy. The head of Russia’s space agency Roskosmos Anatoly Perminov and the general director of Ukraine’s National Space Agency Yury Alekseev signed an agreement about cooperation in the field of the development of the Russian global Satellite Navigation System GLONASS.